USOpenTennisSuites.com provides the very best options for US Open Tennis VIP luxury suites and tickets to the US Open Tennis Championship Tournament held at the USTA National Tennis Center at Flushing Meadows in Queens, New York. In addition to upper level seats and premium lower level court-side seats, we can even put you into a world-class luxury suite for the big matches. Along with some of the finest New York City hotels, we specialize in full-service hospitality packages for the most discerning corporate groups and VIP clients. Your USOpenTennisSuites.com sales representative will gladly answer your questions, and professionally consult with you about all of your options for US Open tickets, suites, or hotel rooms close to the venue and convenient to the action. Year after year, professional tennis fans from around the globe reach out to USOpenTennisSuites.com for the most reliable service in the industry. We are the undisputed leader in premium US Open tickets. We are the main source and supplier for tickets and hotels for the US Open Tennis Tournament. Our company’s primary mission is to provide the best possible service and we take thatresponsibility to our clients very seriously. Our policy is to make sure that our clients receive every possible option and always get a great deal on their tickets. We very much appreciate your trusting in us to help make your US Open Tennis experience memorable. Our careful attention to detail and expert customer service ensures that every single one of our clients get to enjoy the US Open Tennis Championships without any hassles or headaches. Our services are fully guaranteed, and our customer satisfaction rate makes us the most knowledgeable, friendly, safe, and reliable company for the US Open. 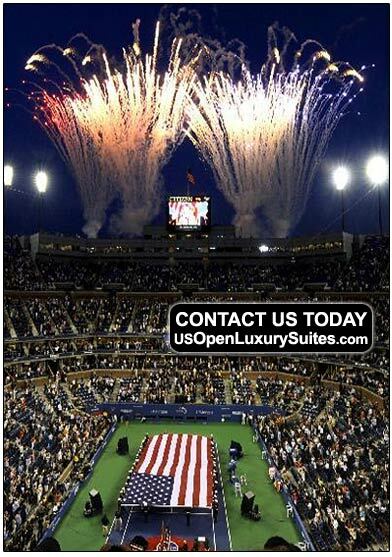 Please contact us for more information about US Open luxury suites, US Open tickets, and US Open Luxury VIP Hotel Packages.